Many thanks for your interest in the Huertgen. Please read this as best you can. My dear wife Helen, whom I lost 6 years ago, was a good typist, but at age 84 it is better for me to hunt and peck on a typewriter than to try and write this letter. Please bear with me my vision is poor and a magnifying glass helps. Helen saved the Army souvenirs that I mailed home to her. I have made copies and pictures of them for you, and have included them in this package. My school friend, Steve Mengulas, and I graduated from John Marshall High School, in June of 1943. We were both drafted into the Army in November of 1943. We remained together until we were assigned as replacements to the 22nd Regiment of the 4th Infantry Division. My friend Steve was killed in the Huertgen a few days later. I have copied and included his picture from our high school year book. The 4th Infantry Division was composed of the 8th, 12th, 22nd Regiments. Each regiment was supposed to have 3000 men, but I doubt if they did. I will write as things come to mind. In the Huertgen I was assigned to the ammunition and pioneer platoon HQ. Co., 3rd Bn, 22nd Regiment. My platoon had the same job until the end of the war in May of 1945. We did some mine sweeping, but not much. We had two main jobs, keeping everyone supplied with .30 caliber ammo for their M1 rifles, and the next job was to promptly picked up the soldiers in our battalion that had been killed. We put them on stretchers and took them not very far away and turned them over to the graves registration people. They were treated with special care, humility, and honor. There were so many young soldiers, although some were in their 30´s. A few of the men said the Huertgen battle was worse than their landing on Utah Beach on D-Day. 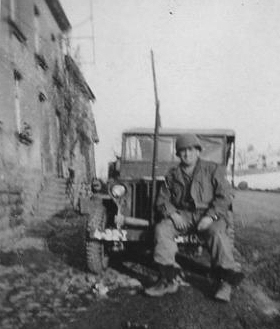 Life magazine did a major story about my outfit, the 4th Infantry Division, in the Huertgen. We were not allowed to have cameras, and we had to turn our letters in unsealed so that the censors could read and approve them and then mail them. Helen told me later that, in one of my letters, I had included the name of the ship that had taken me to the ETO, but the censors had blacked it out. I came home on the ship, Ile de France , in July of 1945. The ship and mess hall was so crowded that everyone was eating Hershey bars to get by. On the ship they asked for volunteers in the kitchen, so I volunteered. I ate in the kitchen, but I ate great until we reached New York. In NY harbor we were greeted by small boats and ships with bands playing music. I am sorry that troops that came home by airplane from later wars missed such a well deserved greeting. I am rambling on as things come to mind. The 4th Infantry Division was in the 1st Army, then transferred to the 3rd Army, and finally was transferred to the 7th Army, but it made no difference. It seemed so strange to see a wire strung between two trees with turkeys strung on them for Thanksgiving as I was riding in the back of a truck with other replacements in the Huertgen Forest. The next thing I saw was a dead German soldier laying close to the mud road and I thought he should be moved to avoid being run over. I went on and joined my platoon. I will always remember days later it appeared we had come to the end of the forest, but no one said so. One night Nicolas Antounex (not sure about the spelling) and I were told to take a Jeep to the battalion commander. Nick drove and on the way we got stuck in the mud all the way up to the bottom of the Jeep. He raced the motor so hard the Germans apparently heard us. They shot 88's at us, and as they came pouring in we laid in a ditch beside the Jeep. Nicky, a Catholic, prayed so loud, almost screaming, and I felt included. As a Protestant I didn´t understand all of those beads, but I did the cross and it was a comfort. Later Nicky gave me a rosary. We finally got the Jeep out of the mud and took it to the battalion commander. He was at the front giving instructions to his battalion. There we were in the woods along side a wide open field about the size of a football field. The Germans were across that no mans land in the woods. We were told that a 105 anti-tank gun on wheels need to be moved to a place in the woods where our anti-tank platoon was waiting, but could not be moved through the trees where we were. It was hooked to the Jeep and Nicky and I were told to tow it another way through the woods and get it to where the anti-tank platoon was waiting. We did, and was told later that it helped. We were both given Bronze Stars. In the Huertgen the Germans built some good foxholes, and at times we would take them over. In the forest we picked up one of our dead from one of those German foxholes. I always wondered if he had been hit and crawled in there and died, but the answer is unknown. Almost forgot to mention, in the Hurtgen, walking in the woods close to a muddy road, heard and felt a loud explosion. One of the jeeps had hit a road mine. I walked over and saw that the right front of the jeep was heavily damaged. The G.I. in the right front was unconscious, and the driver was talking out of his head. Company commander, Capt Mullins walked up, told him I was okay. The jeep driver then made a comment that didn't made sense: "Captain, sorry I messed up the jeep". In the Huertgen I only saw one of our tanks and it had no one in it, but it had been left in an awkward position. The front end of it was stuck about 6 feet up a big tree. I did get under the rear of it for protection because the German Messerschmitts were skimming along the tree tops strafing us. That was a most helpless feeling. We could tell the difference between our planes and the German planes. I remember the massive number of our bombers flying over and I was concerned when I saw the black flak from the German guns exploding in the air around them. Another thing I just remembered, on a clear day it appeared to be snowing, but instead our planes were throwing out little shreds of tin foil to mess up the German radar. It was the most wonderful feeling when the American troops came in to replace us. From the Huertgen we moved south. My platoon was in the town of Echternach in the Grand Duchy of Luxembourg. Very soon the Battle of the Bulge started. No American division in France has excelled the magnificent record of the 4th Inf. Div., which has been almost continuously in action since it fought its way ashore on the 6th day of last June; but in my opinion your most recent fight, when such a depleted and tired division you halted the left shoulder of the German thrust into the American lines and saved the City of Luxembourg, is your most outstanding accomplishment. We moved north retaking lost ground. It did not compare to Hurtgen. That time we were in the 3rd Army. We were in the town of Bech when we saw a long line of tanks end to end, maybe 50, moving through. The weather improved allowing our air force to strafe and bomb the Germans on 3 fronts. Our air force came in with massive accurate force, so much so that we could feel the ground shake. Some one had a camera and later gave us photos of it. We were able to move on. I think we were in the village of Osweiler. It was there our company gathered for a Christmas turkey dinner. It was a feast. 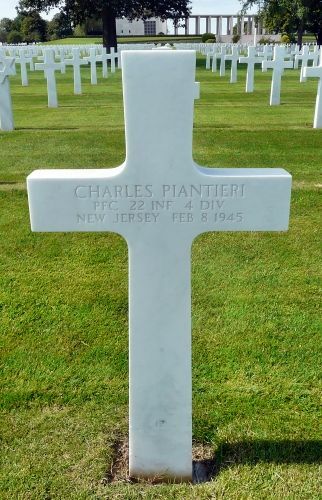 I have included a photo of my friend, Charles Piantieri who was killed on February 8. 1945. I recall just what happened and when. He was with Paul Pupkiewitce when he was hit. Paul said he died within a few minutes of being hit, and his last words were, "Tell the fellows not to complain". I shall never forget his last words. 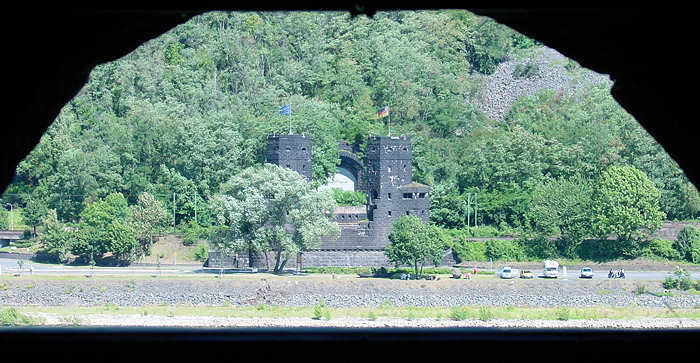 It was great for the morale when the platoon found and crossed the Remagen bridge. We were followed by lots of troops before it collapsed. Many years later my dear Helen and I saw the remnants of the bridge that were still there. 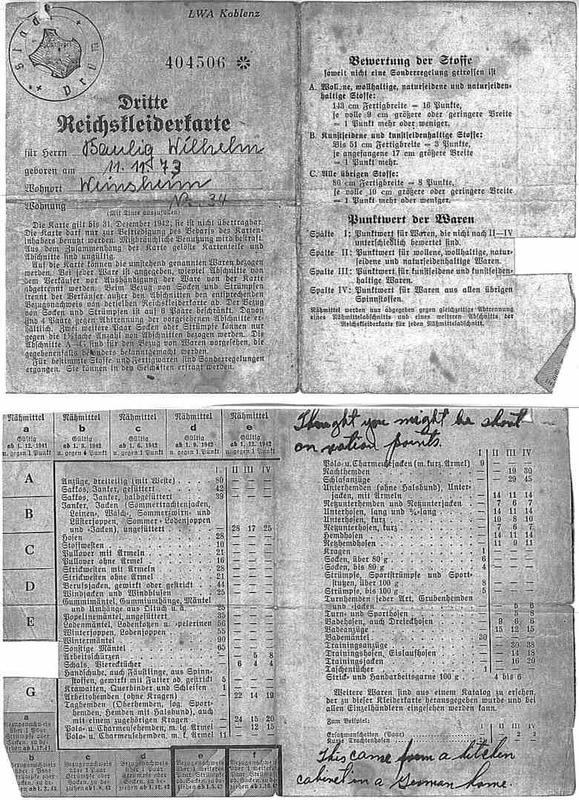 German Food Ration Booklet that Robert got out of a kitchen cabinet in a German home. That night we were told that some of our soldiers were trapped in the basement of a building and couldn´t get out, because there were Germans on the first floor. Max Freid and I were strapped up with flame throwers and were told to fire in the first floor window of that building. While being led to the building we were stopped by our anti-tank platoon. They asked what we were doing. When we told them, their Lieutenant said he had a better way, with a 105. Max and I were very relieved that we didn´t have to shoot those flame throwers. I recall we crossed the Rhine river at night on a floating bridge near Mainz. Later we crossed the Danube river the same way, at night on a floating bridge. On another day we waded a small river, that was not very wide or deep, but it was cold. I think it was named Kyll river, but not sure about that. I don´t know if it´s true or not, but we were told Patton waded the river before us. Another random thought, the German soldiers had metal plates nailed to the bottom of their boots. One night Sgt. Olson and I were sleeping near the door, in a building. We were awakened by the noise those metal plates would make. The noise was coming toward us, so we knew it was a group of German soldiers. As they got closer we yelled halt! Right away there was a yell back to us, don´t shoot! It was some of our soldiers taking some captured German prisoners back. In my company we had a native German, Karl Schraeder. He was used as a translator sometimes when we were interrogating German prisoners. One day Karl told me that some of our interrogators would ask some really stupid questions, but instead he would ask the prisoner a simple question, like asking about their family. Then Karl would give the interrogator some proper answer. By that time the Germans knew they had lost the war. Some of the civilians remained in the towns, and we were told not to fraternize or talk to the Germans, but we did. Upon our arrival as we approached the German towns the soldiers would flee, but before leaving they planted mines in the road. As we approached, the civilians would come out and show us the location of the mines. We would detonate them with TNT and no one was hurt. By that time, I think we were in the 7th Army, but it made no difference. The winter of 1944 was very cold with lots of snow. We were given white sheets to wrap around to camouflage us and blend in with the snow. They just got in the way so we didn´t wear them much. The Germans left more of their dead soldiers behind. Some were frozen and some had died from trench foot. Patton said we could do something about the Germans, but the weather was too bad. We picked them up and handled them properly, but they were kept separate from out dead. I recall only having one shower in that time. We had a shower tent set up next to creek. We used our helmets as wash basins, but we did not launder any clothes we just threw them away. The supply department gave me new clothes, long johns, 2 pair of pants, and 2 shirts. Because it was so cold, I put them all on at once. During that time there was lots of diarrhea. We all looked out for one and other until it passed, even the prisoners had it too. It would have been a good thing if the Army would have had chest protectors like they have now. There was constant artillery shelling from our 155´s and the German´s 88´s. However, our people sent more out than the Germans sent in. It was said the velocity of their 88 shell were faster than our artillery shells. The shells had a distinct sound going through the air. The Germans had another weapon we called the "Screaming MeeMe", although I never saw one. I was told it shot several shells at one time, perhaps, about the size of hand grenades. It got it´s name from the screaming noise it made coming in. I think it was in southern Germany when the 4th Infantry Division came upon a concentration camp, we didn´t know about them. We were not the first to free the inmates, but we were there soon after. There were no German soldiers there, just adult inmates. I did not see any bodily harm, just weak, confused, and hungry people. They were identified as displaced persons. We set up our kitchen there, and the Army made some of the worst tasting lamb stew, but the inmates thought it was a feast. We went on into a small town where the civilians met us waving white flags. Very soon we were moving so fast that we rode in trucks on the autobahn. Beside the road I saw abandoned German bombers. At the end it was said that we were in Czechoslovakia, we didn´t know and cared less. The war was over. In a little time the 4th Infantry Division was put on 40 and 8 boxcars and sent back across Germany. We stopped in Amberg/Ober (town may be wrong), then in Bamberg, and then on to Le Havre, France, and home. The war was still on with Japan, and maybe that is why we were shipped home early, for a 30 day furlough. Soon after that the war with Japan end. We were sent to Camp Butner, North Carolina to await for our points for discharge. We had a hard time while we were there, several of us slept side beside on the floor. One night, I put my helmet on a side wall shelf and during the night it fell off hitting Chico, a fellow soldier, on the cheek. He got really mad at me, and went to the medic. They put a band-aid on his cut and sent him back. He told me to forget it, which I did. Now comes the funny part. While at Camp Butner awaiting points, Chico came to me and apologized for getting mad when my helmet hit him. He explained to me that with the band-aid the Army gave him a Purple Heart and he got 5 discharge points for it. 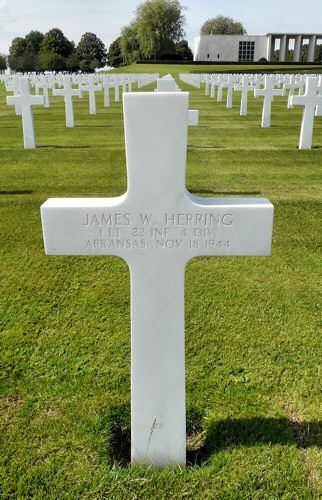 Something I forgot to mention, my platoon leader , First Lieutenant James W Herring was killed in the Hurtgen on November 18,1944. 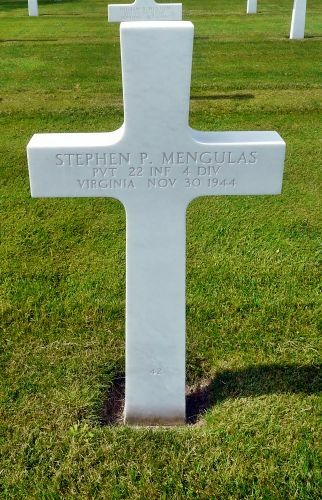 He is buried in the same cemetery, Henri-Chapelle American Cemetery / Belgium, as my friends Steve Mengulas and Charles Piantieri. Saw in writing, 4th Infantry Division WWII casualties to May 2, 1945, 4,097 Killed in Action, 17,371 Wounded in Action, 3.757 Died of Wounds. In combat everything was free, including cigarettes etc. Our pay was held back a month, and Sergeants made $78.00 a month plus $10.00 for combat badge. I get excellent care at the VA Hospital in Richmond, Virginia. I have a 70 percent disability, so I get a good monthly check, tax free. To make Bob's original text more readable, the above text was edited by Thomas Ratliff and the webmaster. Some names, places and figures were corrected.